Korea aims to attract a total of 80 trillion won ($71.2 billion) of investment from both Korean and foreign companies to the nation’s free economic zones over the next decade by attracting Korean anchor companies and giving more benefits to new industries and service sectors, according to the government on Monday. Korean Free Economic Zones are specially designated areas created to improve the business and living environment for foreign-invested firms in Korea. Since the inauguration of an FEZ in Incheon in 2003, the number of FEZs in operation has grown to seven: Incheon, Busan-Jinhae, Gwangyang Bay Area, Daegu-Gyeongbuk, Yellow Sea, East Coast and Chungbuk. Of the seven economic zones, there are 4,729 resident companies, with 331 companies being foreign-invested, according to the government. On Monday, the Ministry of Trade, Industry and Energy released its plan for free economic zones over the next decade, saying the nation aims to attract investment of 80 trillion won -- 64 trillion won from Korean firms and 16 trillion won from foreign companies -- from the seven FEZs from 2018 to 2027. Over the last five years from 2013 to 2017, Korea attracted 30 trillion won, with 19.7 trillion won from Korean firms and 10.3 trillion won from foreign companies. “So far, we have offered little incentives such as relaxation of regulations or tax benefits to local anchor companies that can create synergy with foreign-invested companies,” according to the plan released by the government. The government cited such cases as Hong Kong and Singapore, which provide incentives including tax benefits and cash support for companies of key sectors and industries, whether they are local or foreign. Korea will also focus on attracting local anchor companies in industries with high demand so it can better lure foreign-invested companies in similar sectors. The Incheon FEZ is also a good example in Korea, having succeeded in luring global firms such as Samsung Biologics, Merck and Dong-A Socio Holdings after attracting local medicine producer Binex, the government said. The Industry Ministry also said it would shift the focus from traditional industries to new industries and service industries. The new industries include future automobiles, financial technology, drones, the smart city, smart factory, smart farm, new energy and bio health. Compared to other industrial complexes centering on manufacturing in Korea, 55 percent of resident companies in free economic zones do business in new and service industries, the government said, as of 2015. Each region will specialize in new industries. Incheon will focus on bio health, drones and the smart city. Daegu-Gyeonbuk will center on future automobiles and the smart city. 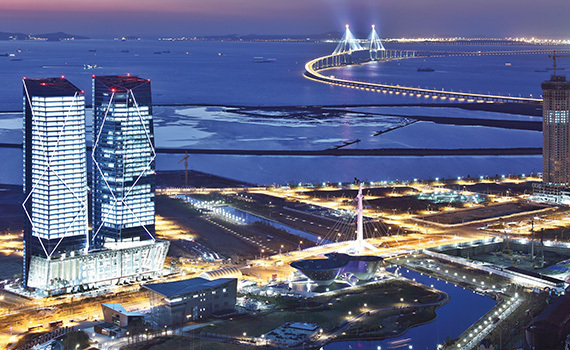 Gwangyang Bay will focus on the new energy industry. And Yellow Sea will specialize in smart factories. For the service industry, the government will foster diverse products, including medical tourism, complex resorts and tourist resorts. Medical tourism utilizing medical infrastructure, tourism facilities and professional hospitals for recuperation will be improved. Also, complex resorts centering on the island of Yeongjongdo and a global green complex in partnership with the Green Climate Fund will also be developed, the government said. Service sectors are known to create more value-added businesses and jobs. Per $1 million in services or products exported, 21.3 jobs are created for services and 8.2 jobs created for products, the government said. In September, US consulting firm McKinsey & Company recommended Korea to foster service industries, saying the nation’s manufacturing and employment are expected to reach the limit in 10 years.